1. Amazing ID photo quality. Sharp, true color, vivid images. Build-in flash provides an ability to capture uniform photos not depending on lighting conditions. The captured ID photo quality is far superior to ID photos made with web cameras or common security cameras. 2. Streamline procedure to install, learn, run, and use inPhoto Capture SLR / inPhoto ID SLR for Canon SLR camera control. Intuitive, straightforward, and very user friendly interface. 3. Full control all camera settings from PC with inPhoto Capture SLR software. 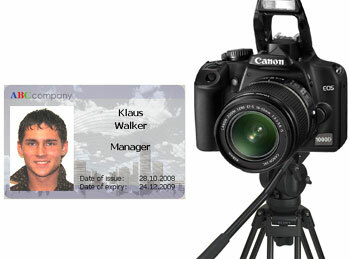 inPhoto ID SLR software controls camera settings important for ID photo application. Canon SLR camera settings are easily accessible in the software interface and can be adjusted by the user with just a few mouse clicks. 4. All latest Canon SLR cameras have LIVE image preview in the software window on the monitor screen providing an ability to view ID photo and control its quality before capture. 5. The large size of live image preview window. 6. Direct ID photo export to all standard ID card applications (Incardex, Asure ID, EPI Suite, ID Works, ID Flow and many others) if camera is used with inPhoto Capture SLR / inPhoto ID SLR TWAIN driver. 7. Exceptional speed - capture to file takes 3 seconds, capture via TWAIN to ID card software takes also 3 seconds (1936x1288 camera resolution). Canon SLR camera works faster comparing to Canon Powershot cameras. 8. Rugged durability - Canon brand speaks for itself. High camera quality and long life are guaranteed. 9. New models of Canon SLR cameras have longer product life comparing to Powershot cameras: Canon Powershot camera becomes discontinued approximately within a year after is was introduced. Canon SLR cameras stay much longer (3 years and more). 10. SDK availability. Canon company declares that it is planning to continue supporting SDK for SLR cameras. It means that all new Canon SLR cameras will be supported with inPhoto Capture SLR / inPhoto ID SLR software. 11. Affordable price of Canon EOS DIGITAL REBEL T3 / Canon EOS 1100D in Europe and USA comparable with the price of sofisticated Canon Powershot cameras.